This weekend is all about the dads. The ones who teach us about our favorite sports, push us to our greatest limits, stay up late at night to watch those really good games, the ones we share a unique bond with. If your dad happens to be a huge hockey lover, then we’ve got the weekend covered for you at most of our locations. Is dad in need of a new hockey stick? Then you’re in luck as we’ve got our CCM RBZ 150 Senior Sticks on sale for $74.99 (originally $199.99) – that’s right, more than 50% off one of our greatest hockey sticks and most popular hockey sticks! We also have the Bauer MX3 LE Senior Sticks on sale for $159.99 (original price $269.99) and we have tons of other in store specials on hockey sticks for Father’s Day too, so you can be sure to pick the hockey stick that best fits your dad. Be sure to check out our deals on the Bauer X PRO player gloves and Easton Synergy 80 player gloves as well, on sale for Father’s Day only for $59.99 (originally $99.99). If you’re looking for something small to go with a bigger gift or something that most people’s allowance will cover, we’ve got Elite X-700 Performance Socks (mid calf and knee length socks) for just $6.99, which is a whopping 50% savings! Every dad needs socks. Your dad always taught you to get the best deals around, right? 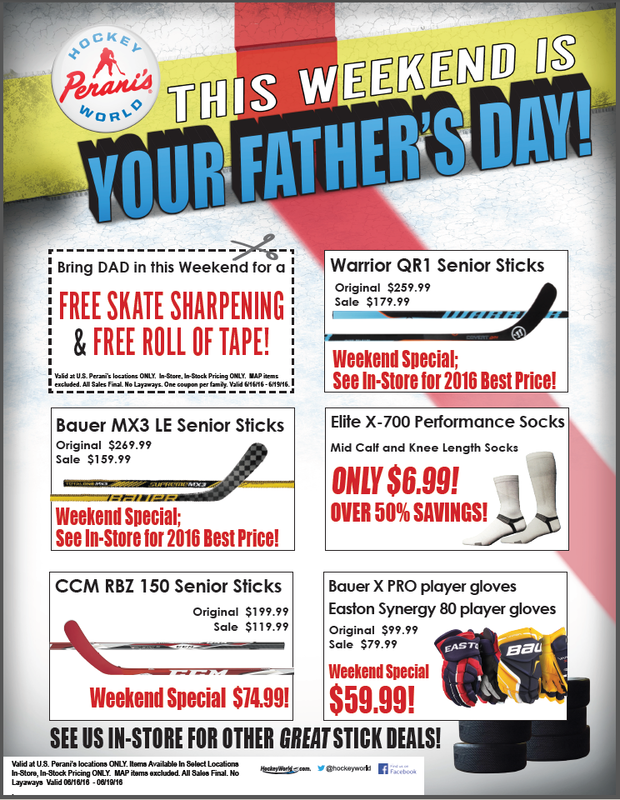 Then he’d surely be proud of these great savings and deals at Hockey World throughout Father’s Day weekend! *These prices are good for items that are in store and in stock only. Prices and sales may vary by store. If you don’t live near one of our locations, we have some great deals online too. And of course you can’t ever go wrong with a gift certificate in any amount – which can either be purchased in store or online. And after you get dad a great Father’s Day gift, don’t forget to tell him thanks for being one of the greatest.